17th to 21st October 2016, Paris France. 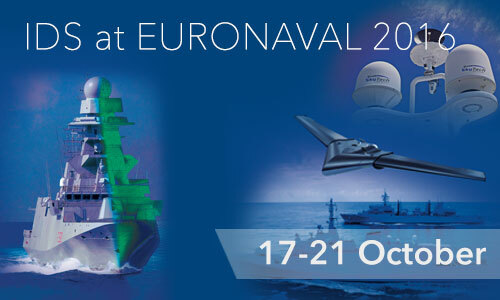 IDS will be attending Euronaval 2016 in Paris Le Bourget. At the 25th edition of the world meeting on naval technologies IDS will present our range of products for the “Electromagnetic Ship”, which includes EM design services, measurement systems for RCS, IR signature and EMC/EMI and special materials. We will also showcase configurations of our Manta and Colibrì UAVs for PLASTIC (photogrammetric and electromagnetic field measurement system) and our UAV ground control station and training simulators. Finally we will show our latest developments in ship communication applications with the satellite terminals recently introduced to the market in collaboration with Skytech. Come and visit us at Stand K86. 29 Nov: SIMCENTER CONFERENCE – EUROPE: COME ABOARD!